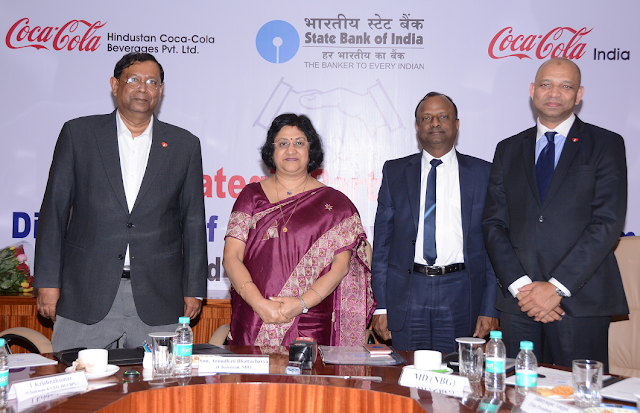 India 4 January 2017: Coca-Cola India (CCI), Hindustan Coca-Cola Beverages Pvt Ltd (HCCBPL) and State Bank of India (SBI), today announced a strategic partnership to enable 2.6 million retailers and 5000 distributors to conduct business transactions digitally. As part of this partnership, training sessions will also be arranged to help small retailers enhance their digital skills and understand the benefits of adopting cashless transactions. The two companies today signed an MoU, by which retailers can open a current account in any SBI with Corporate Net banking (CINB) facility. Then, the retailers would be trained by SBI’s authorized trainers along with Coca-Cola, on new and evolving digital business transaction solutions and initiated into SBI’s digital payment options such as Buddy P2P, Buddy Merchant App, SBI Pay etc. Mr. T. Krishnakumar, CEO, Hindustan Coca-Cola Beverages Pvt. Ltd. & Regional Director – South Asia, said “We recognize and support the Government’s vision of “Digital India” centeredon making India a digitally empowered economy. We have been forerunners in the digital solution space and while all of our payment to Suppliers and more than 90% of our collections from our partners are digitized, we propose to extend this facility to every retailer in the marketplace. Our partnership with SBI is a step forward in this direction. The digital payment solutions in business transactions will help further strengthen our retail chain ecosystem covering over 2.6 million retailers and 5000 distributors and will substantially reduce the dependence on cash. There is huge potential in e-commerce and m-commerce space, and this partnership between HCCBPL and SBI will go a long way in capitalizing on these fast growing opportunities”.